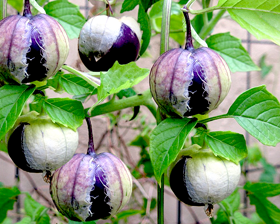 Tomatillo produces masses of purple blotched yellow flowers followed by golf ball sized, sticky fruits encased in a papery husk. 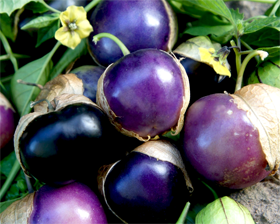 It is very versatile as can be used unripe in salsa, or when sweeter and fully ripe , cooked for pies and jams or simply eaten raw. Fruits over a long season, stores well in warm place. Sow February to April to grow in a greenhouse. Sow April for growing outdoors in sunny sheltered site. Sow seeds 6mm deep in pots or trays of good, free draining, damp seed compost and cover with a sprinkling of vermiculite or compost. Place in a propagator or seal container in a polythene bag at 18-21C until germination, which takes 7-14 days.